Where science-fiction and fantasy, religion and mythology, blend together. Rabbi Roni Tabick delves into the mythic dimensions of Judaism and writes fantasy from a religious perspective. When I was about 4 years old, some reporters came to interview my mother about her work as a rabbi. They spoke to my sister as well, who obligingly told them that she wanted to grow up to be a rabbi. I was not so helpful, and my answer never made it on to TV - when asked what I wanted to be when I grew up, I answered 'He-man'. Fantasy and the mythological has always entranced me, so when I realised that we had such stories and heroes in our own tradition, I fell hopelessly in love. This blog is called Mythic Writing, and today I want to do something a little different, and reflect on why I chose this name. You see, today I turn 30 - not perhaps the biggest milestone but it seemed to me that this was an opportunity to write down some of my deepest held beliefs - why does mythology matter to me? And why should it matter to you too? Joseph Campbell once wrote that "myths are public dreams, dreams are private myths". In expressing this thought Campbell reveals some of what makes mythology so inspiring and so important - a myth is not something untrue, not bad history or bad science, but a shared dream. Mythology represents humanity's earliest attempts to understand the universe and our place in it, to answer questions of why the world is at is. Mythology is fundamentally about stories that explain why things are as they are, and how we should behave given that reality. What's the difference between myth and my other great love, fantasy? Fantasy is the work of individuals, not the product of a culture. Mythology belongs to a society, and a living myth has a people that see in it ultimate meaning and value. To be Jewish is to identify with Jewish myths and stories, far more than it is about statements of belief or practice. 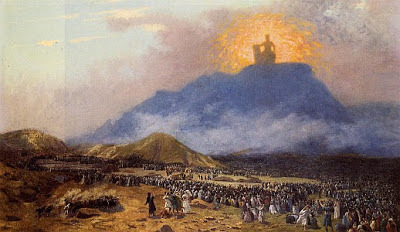 To identify with the exodus from Egypt, to be able to say that we were slaves in Egypt, that God gave us the Torah on Mount Sinai, these are some of our holiest stories. And mythology is brilliant because stories, unlike dogma, are endlessly adaptable. Like poetry, the best stories are capable of myriad explanations, and the holiest stories have infinite aspects. Mythology represents the best way of finding meaning in our lives, of living in such a way that we are connected to our highest selves, the nation around us, and to the divine. The greatest principle is to see ourselves in our own stories, to understand that the stories of the patriarchs, of Moses, of the rabbis - are really about us, our reality, our minds and our society. They are the voice in which God is speaking. If you hear a torah reading, ask yourself how this is about you. If you go to a seder, try to hear what God saying through the power of the story. Because Human beings are creatures of story, and the tales of mythology are the stories that matter the most. There's a Yiddish saying: "God created the world because He loves stories." As an anthropologist and a future rabbi, this was a brilliant and succinct way of putting it. Thank you. Identifying with, engaging with, and living with the stories doesn't mean belief in their literal truth. But the various practices and rituals we've built around the stories ARE important, they are in fact a large part of the way we engage with the stories and keep them alive. It's not just the story of Exodus, it's reliving the story through pesach and the seder and sukkot. There are also other aspects of Jewish practice not as directly tied to the stories (eg marriage rituals) that still serve to tie us to our heritage. I actually agree with you, and find myself wishing that I hadn't phrased that sentence like that. I do think that practice is a vital part of the participation in myth - and life cycle events like marriages very much are part of that. Marriage rituals reenact the garden of eden, the destruction of Jerusalem, and the hope for the messiah - can't get much more mythic than that. Perhaps this requires it's own blog post in the future - why halachic practice matters. Rabbi of New Stoke Newington Shul, Assistant Rabbi of New North London Synagogue, Roni lives in the UK with his family. All material is copyright of Roni Tabick. Ethereal theme. Theme images by zbindere. Powered by Blogger.